Diamond Dust Zone is the fourth level of Sonic 3D: Flickies' Island for the Sega Mega Drive and Sega Saturn, coming after Spring Stadium and before Volcano Valley. As with other stages in this game, Diamond Dust consists of two standard Acts followed by a third Act containing only the boss fight. In Acts 1 and 2, Sonic must free captured Flickies from inside Badniks, depositing five of the birds into a Goal Ring to progress between sections of the level (usually three per Act). This Zone seems to be heavily influenced by IceCap Zone from Sonic the Hedgehog 3, and features some great music. 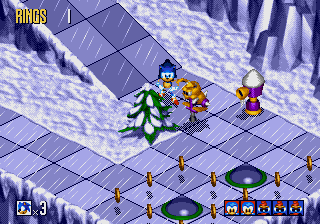 The level takes place in a winter environment, with slippery ice and snowy gusts everywhere. The boss of this level also seems to be heavily influenced by Sonic 3's IceCap Zone, with Robotnik trying to do nothing but freeze you. The environment plays a big part in the level. Some areas are covered with ice that is very difficult to get around on. Snowblowers blast frost that will freeze Sonic instead of directly attacking him, though unlike in IceCap Zone, the freezing is harmless (though it will make him lose his Shield and Flickies) and is sometimes even required to progress; Sonic can even break free by jumping enough times. When Sonic defeats the Snowman Badniks, he will find that some of the Flickies inside them are frozen. He will have to open the block of ice before he can free the Flicky. Some snowmen are not Badniks, but are actually bombs that will explode upon close proximity. Snowman — A snowman robot. Releases a (frozen) blue Flicky. Bunny — A rabbit robot on a pogo stick. Releases a purple Flicky. Pengo — A waddling penguin robot. Releases a green Flicky.